Our experienced trainers will provide delegates with confidence and the ability to perform efficiently within their companies. The course also includes flexi-time IT training available for the MS Office module at the end of the class. The Office Manager Diploma training course is suitable for administration staff looking to become a supervisor or office manager; existing office managers looking to enhance on the job performance and knowledge/skill base. Course pre-requisites: Some office experience; good general education. By completing this training course, delegates will gain improved and more confident on the job performance. They will also be provided with a Certification for successful completion. IT software and hardware; communications equipment. Microsoft Office training (MOS) in three MS Office products of your choice to Proficient Level (or Expert if preferred) within our Microsoft Academy environment. 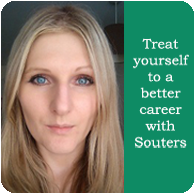 The cost of the Office Manager Diploma with Souters is £1,199 per person. Fill out your details to find out more about Office Manager Diploma. Achieving an Office Manager Diploma. Enjoyed Time Management and gaining an insight in the financial side of the business as I have no knowledge of this. I was particularly interested in office management and had some great tips.